Who says you have to have the mass-market diaper bag that everyone other new mom in town is toting? This was such a fun project I did for a client who requested a more untraditional take on the new parent necessity. 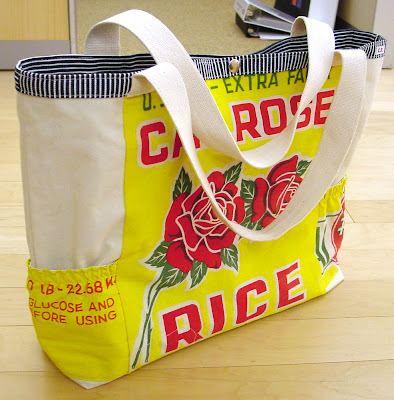 These rice bags are make such such sturdy canvas and the graphics are so happy and bold. The most labor-intensive (no pun intended) part of this project was the lining. As most parents know, there are lots of things to tote in a diaper bag and each compartment is very specific to the items they carry. 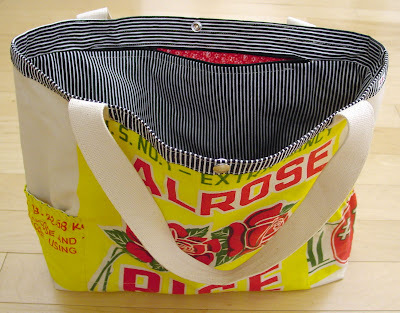 I added lots of pockets, zippered compartments and the traditional elasticized bottle holders on the sides.